Yeah, but: At what price, beauty? 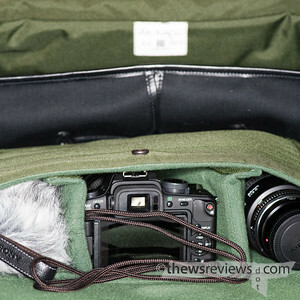 The Long Version: If a camera bag that's made out of canvas with a removable insert, expandable front pockets, and no noisy velcro closures sounds familiar, it should: it's the description for the Domke F1X and F6 that I've written about before. They're great bags, and until last Tuesday, I thought they were pretty expensive. Last Tuesday, I met my first Billingham bag. 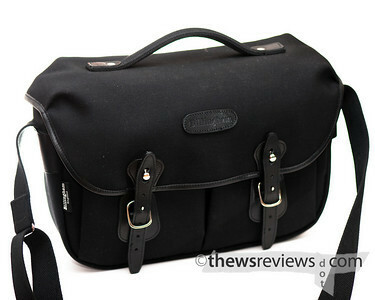 The Hadley Pro, the subject of this review, is possibly Billingham's most popular bag. It's the replacement for the Original (medium) size, and the line is also available in Large, Small, and the even smaller Digital. (The 'Pro' has a couple of distinct features that I'll get to later in the review.) On paper, it reads very much like a Domke bag, making it yet another example of gear to try in a store instead of shopping by the specs. Both bags are canvas, but the tighter weave of the Billingham's fabric and the attention to detail in its construction leaves the Domke looking a little like a burlap sack. They both have removable inserts, but the Domke's is held in by velcro, while the Hadley has a single snap button. Domke uses metal carabiner-style clips to keep the lid closed, but its British counterpart uses elegant adjustable leather over brass or nickel studs. The F6 and the Pro both have grab handles, but one's a fabric strap attached to D-rings, the other is a shaped handle sewn and riveted to a fiberglass stiffener that's placed within the double-layered fabric top. 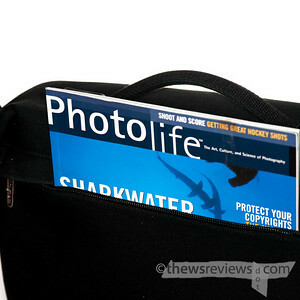 "What will fit in the bag" is a popular subject on camera-gear forums. Normally, people will want to know if a particular synthetic box-on-a-rope will hold their Canon 30D with its accessory grip, or their Nikon D300 and 18-200 f/dark. When people talk about the size of Billingham bags, the metric is invariably how many Leica rangefinder bodies and lenses they can carry. There's a reason for that: Billingham's Hadley Pro costs triple what the Domke F6 does, and they hold about the same amount of gear. Compared to the more similarly-styled Domke F803 Waxwear, it's still over twice the price. One of the grand achievements of camera bag design may be getting them to not look like camera bags. Crumplers and Domkes are the ones usually included in this group, but even the Lowepro 'Slingshot' series gets credited with this ability, and Think Tank's built a whole series around the idea of an 'Urban Disguise'. This black-on-black Hadley is probably the second-least camera-bag-looking-bag I've seen, but that's because it doesn't have contrasting trim. The Billingham khaki-tan bags are very distinctive, and anyone who knows them will know what's inside. Even worse, because the bags themselves are expensive, they imply a higher value for their contents which is bound to make them more popular for smart camera thieves. (Dumb camera thieves will just have to make do with stealing Lowepro Slingshots.) No camera bag is really going to provide anti-theft protection, especially if you actually use your camera. 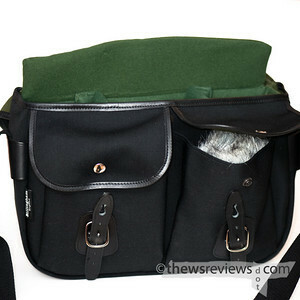 This photo shows what the Hadley Pro was carrying in the third image of the review. There's a D700 with Stumpy attached, an SB900, 85/1.8 and 35/2.0. Being a satchel-style bag, the D700 is about as big as it can hold without bulging, but its deep-but-narrow design means that the big 105VR doesn't need to be detached from the camera. The front pockets are still empty, and they can hold quite a bit as well. The SB900 could sit in one, as can my Sony PCM-D50, which isn't a small audio recorder. They even have a second snap-button that lets the front pleated pockets expand, and the buckles on the straps let them lengthen to hold the lid securely closed. It can even have accessory pouches attached to the sides, creating extra room for phones and compact cameras. During one recent outing, I had the D700 and F100 down each side, with the 50/1.8 and 105/2.8VR stacked down the middle. A 35/2.8, with the awesome HN3 metal hood attached, was underneath the F100 body; I probably could have put a similarly-sized lens under the D700 as well. 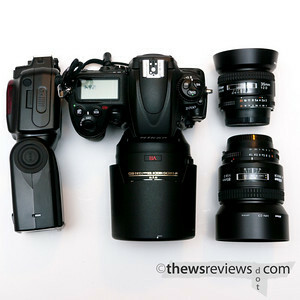 (Substitute any large body without a portrait grip for the D700; the F100 is a solidly mid-size camera.) I couldn't have pushed it much farther than that, but I also had my big iPod, Blackberry, and wallet in one front pocket; a spare roll of film and an 8oz flask - for water, honest - in the other. The result wasn't light, but the bag looked like there was nothing in it. But buying a Hadley and stuffing it to the gills is an exercise in missing the point. (That's what the other Billingham styles are for.) It can hold a lot, but it's easiest to work from - and looks better - when it's more modestly encumbered. My typical load for it is shown in the photo below. My GH1 has the 14-140 lens attached, and two more lenses are stored down the side. Beside it is my audio recorder, leaving room in the front pockets for batteries, iPod, sunglasses, and so on. It makes for a great working kit and travel bag. It's nondescript but stylish, small enough to carry into MoMA, and pretty much indestructible. About the only way to improve it for travel would be to add a slim compartment inside one of the front pockets to hold a passport. The Hadley's insert is fully padded and takes up the entire main compartment, and is held in place with a single snap. That's plenty to keep it in place when the bag is being used, but it's worlds easier to remove and set aside than Domke's partial-compartment insert that's secured with velcro. I'm not convinced that I'd actually use the Hadley as a satchel, aka 'murse', as I have other bags for that purpose, but it's always nice to have options. Perhaps I can use it for job interviews. How many other candidates will have bags with serial numbers? There are two real differences between the Pro and amateur Hadley bags. One is the top handle, with its fiberglass stiffener in the lid, and the other is the zippered pocket across the back. These are huge improvements over the original design, and I wouldn't have bought the bag if it didn't have them. When I'm out with my Domke F6, the rear slash pocket is where I put handy little things like my blackberry or color checker while I'm shooting. It's also able to carry books, papers, and tickets when I'm waiting in line to board. It's so useful for quick and easy access that I'm not sure that I like the Billingham's flapped and zippered closure. It makes the pocket waterproof, but it's at the expense of spontaneity and capacity - no matter how well it's designed, it's not quite what I want it for. The zipped pocket itself isn't wide or deep enough to hold a magazine; with the possible exception of Time or Newsweek, few of them lack enough substance to fit. Even a simple sheet of paper needs to be folded before it can be carried, which is acceptable for maps, but the Hadley is nobody's briefcase. Fortunately, magazines - even the fairly thick B&H Catalog - will fit behind the divider in the main compartment, making the current flight restrictions a little more manageable, if no more understandable. In actual use, it's easy to forget that the bag's even there. Its slim profile makes it easy to slip through crowds, parked cars, and other narrow spaces; its small size means that it probably won't weigh very much once the camera is in hand. The fit and feel of the satchel style is very different from the boxy bags that I'm used to, and while stacking lenses means that fewer are immediately accessible, it's a fair trade. The leather lid-release tabs needed a little familiarization, and I do wish that there was a hole half-way between the second (aka 'too tight') and third (aka 'too loose') positions on the adjustment buckles. I've left my understuffed Hadley at the slightly tight position, which keeps the lid fully closed when I lift the bag by its handle, and once the leather has broken in it should be easier to use. Reaching my phone in a front pocket is possible with only one catch undone; when it was time to change lenses, the lid folds back on itself instead of needing to be fully flipped up and out of the way. 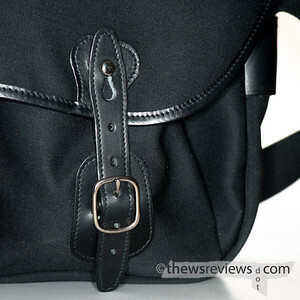 I started this review by emphasizing the cost of the bag, so it's a sensible place to end as well. When sorted by price, Billingham takes up the top seventeen spots out of the 567 items that B&H lists under "shoulder and gadget bags". The Hadley Pro model currently first appears as #42, and all of the first 41 are considerably larger. There's no doubt that it's a premium product, and we all need to pay the internet bill and all of our other necessities. Absolutely nobody really needs to spend this much on a bag. But looking at it the other way, photography isn't a cheap pastime. The Hadley Pro costs less than the price of a modest prime lens or a basic telephoto zoom, a good compact camera, or a few of the cheaper bags that the gear-obsessed photographer will accumulate but not use because they're just not quite right. 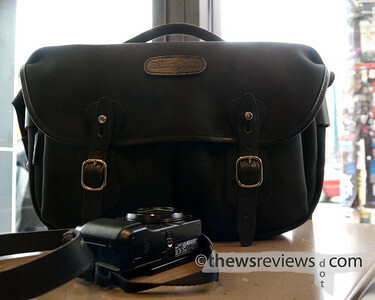 Far more affordable than a high-end tripod system, a Billingham bag is also an investment that relatively few photographers will make, but it's one that will last for years and be a pleasure to use. If there's some photography money that's been declared surplus, it's a relatively cheap thing to buy the best of. You won't regret it. Updated 10 February 2011: After another year's experience with this bag, I've written a follow-up article that you can read by clicking on this gratuitously long link. "...or their Nikon D300 and 18-200 f/dark." Antontrax, it took me a few minutes to figure that out - it was the middle of the night - but it made me laugh. That's exactly how I'd pick them. Thanks for the site that you linked to with your name, too. It looks like an awesome adventure. I don't ride, but I'll still be taking some time to read the whole thread, and keep checking in to see how you're doing. Hello there, I was wondering if you could help me please? 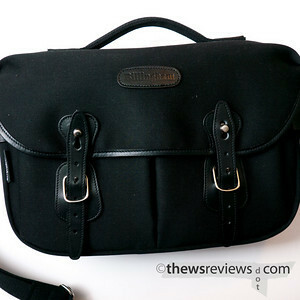 I am currently in the market for new camera/general purpose bag and I'm rather taken with the Hadley range. What I would like to know is: How well do you think my Nikon D300 will fit? Will it only fit facinf downwards (LCD pointing up, as you have your GH1 positioned in the above photo). I usually shot with prime lenses so lens length isn't really an issue, just how well does the 'height' of the camera fit th width of the bag? The Hadley Pro is narrower than the D300/700 is tall, but it's flexible enough that the bag will still hold it. The LCD needs to be facing up, and the camera needs to be on the right side or in the middle of the bag to keep the prism/flash housing away from the end of the bag. It creates a bit of a bulge, but it's not too obvious and the bag still closes properly. The photo that shows the D700, flash, and two lenses is how they were placed in the bag in the photo before it. It's full, but not overloaded. The camera will fit in other ways, but none of them make sense - with the exception of taking the lens off of the body, all of them take up more room and make the camera harder to reach. The Hadley Pro can get away with a fair bit, but it;s still a small bag, so there is a price to be paid. The large size is a little more forgiving, but gives up the rear slash pocket and the handle. Life's a barter. Ah right, I didn't twig that was how you had the load arranged. one important point: Billinghams are the only bags I am aware of which are really waterproof, including seams, cover etc. - from top to bottom. in a (heavy) rain for example you very soon have to protect your bag to protect your gear ("all weather cover" and the like) - not so with a Billingham. And with puddles or wet ground - better do not put your bag on the ground for a prolongued time (i.e. more than ca. five minutes) if it's not a Billingham. moisture will crawl up the seams and into the bag. Well, since you have such absurdly good taste in cameras (as will be seen below), you seem to be the perfect guy to answer my question here. I don't carry *all* of that at the same time; a popular combination is GH2, 20mm, 7-14mm, Ikon, Biogon 35/2 + Leica 90mm, which happens to fit nicely into a Case Logic sling bag that I don't really like. Now, I know Hadley makes smaller bags than the Pro. Do I really need the Pro, or can I make do with a smaller Hadley? O reason not the need! You could certainly fit everything in your two-camera kit into the small Billingham Hadley. I haven't actually tried it, but you've essentially described what I carried for ten days in New York in my Pro, except that I still had enough room left over inside to fit an 18oz 'Kleen Kanteen' water bottle (with a flat-topped lid) down the middle. The lenses would be stacked under the camera bodies, and I would have to shuffle things a little bit depending on what lens was on which camera. There wasn't enough room to put away both cameras when they both had the big lenses aboard (7-14 and 4/85), but that was rarely an issue. But to pick up your wording a bit, a Billingham isn't something to 'make do with.' They're fantastic bags, and the size difference between the Small and Pro isn't so great that the Small is going to be much more convenient to carry, while the Pro is bigger enough to be genuinely more useful and look less like a purse. The Pro also adds the significant features of the top handle, which makes a loaded bag much easier to carry and control while riding the bus or disembarking from your luxury yacht, and the back zippered compartment is perfect for passports and opera tickets. So unless you're planning on getting two of them, I'd recommend the Pro (formerly: Medium) size as the better long-term purchase. If you are planning on getting two, well, the Pro will hold everything while the Digital is sized for one rangefinder and two or three lenses. You do have exceptional taste in camera gear; I've reviewed a bit of it here already, and have plans to take a look at the 2/35 Biogon in the next couple of months. I'm also working on another look at the Hadley Pro now that I've been using it for a year. But at the risk of giving away the conclusion, I'll still happily say that it's the best camera bag I've ever used. I know you'll enjoy yours whichever model you choose. Thanks so much for this review, it helped a lot in my decision to purchase the Hadley Pro. Can't wait for it to arrive! What are the differences between this one and the Hadley Original?.. I know one thing, the Pro-version cost 20 Euros more.. The two bags – Pro and Original – are the same size. The Pro adds the top handle and zippered slash pocket on the back panel of the bag. My understanding is that the Original is no longer being made, which might account for some of the price difference, but from my experience I'd choose the Pro despite the extra cost. Okay! Thanks for your quick reply ! I have already ordered one ! I haven't read a camera bag review better than yours. Your opinions amd comments are highly wise, but above all they come from a long experience. Thanks for the effort in puting into words your thoughts, I highly appreciate. Personally I own three camera bags as you wisely guessed, two Lowepro and another one which I don't remember the brand, but now I need another one for a rangefinder gear. And I will undoubtedly buy the Hadley Pro. Sorry, I forgot to ask you what is the difference between the canvas and the FibreNyte material, as in the Billingham site they offer the Hadley Pro in these two different materials. Which material was yours made of? Luisa, thanks for the kind words. Rangefinders and Billinghams are a classic combination, and the Pro is roomy enough to hold a couple of bodies and spare lenses. The bag that I use is canvas. I've handled the Fibrenyte bags, and they look and feel quite similar, but the synthetic seems a little softer to the hand. I'd be tempted to buy a second Billingham in the Sage Fybernite, but I like the traditional canvas too much to have a synthetic as my only bag. The one advantage that I have heard for the Fibrenite is that it doesn't attract or retain pet hair and lint the way the canvas does, which is a particular problem with the black canvas that I have. Would anyone suggest getting the f1.4 over the Hadley Pro to house an iPad 2? Unlike the Hadley Pro, the f1.4 and f2.8 don't have the bucket of removable padding, so there's no internal back 'slot' to slide the iPad (or an 11" Macbook Air, which I carry) into. That makes the Hadley Pro an easy choice.